The Football Association says it will continue to back Michel Platini's bid to become president of Fifa, despite his links to a corruption inquiry. Investigators are probing payments made to the Uefa president by Fifa counterpart Sepp Blatter. The FA announced in July it was backing the Frenchman for the role and said on Wednesday: "We are still of that view." However, it added: "Events of recent days have raised a number of issues which do need to be fully examined." Platini, 60, is being treated "in between a witness and an accused person", say Swiss investigators. 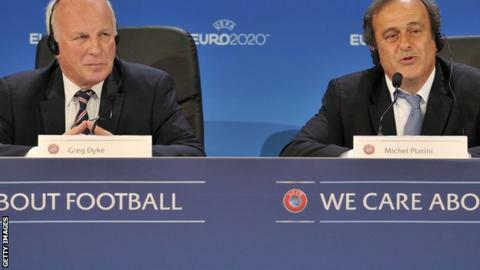 The FA board met on Wednesday and later said it maintained its "unanimous" support for Platini. What is going wrong for English clubs in Europe? Blatter has said he will step down from football's world governing body in February, with Platini among those who will stand for the post. Explaining its support for the former France international, the FA said: "We thought he was an excellent president of Uefa and could bring those same leadership qualities to Fifa." But it stressed: "We are following the ongoing investigation initiated by the Swiss attorney general which Mr Platini is co-operating with in full." Swiss prosecutors are looking into a payment made to Platini in 2011 for work he completed for Blatter almost a decade earlier. "The FA nailed its colours to the mast a full seven months before the election, before they had seen Platini's manifesto, and declined to wait to see which other candidates might stand, ignoring the warning of the man they had supported in June's election - Jordan's Prince Ali - who said that Platini was 'not good for football'." Last week, Swiss prosecutors announced they were investigating Blatter on suspicion of criminal mismanagement in relation to that payment. The attorney general's office said he was suspected of signing a contract that was "unfavourable to Fifa" and making a "disloyal payment" to Platini. The pair are also facing an investigation by Fifa's ethics committee over the issue.